In our paper published in Communications Biology, we show that changes in the metabolism of individual full-thickness skin wounds can be continuously measured in vivo using non-invasive autofluorescence imaging, and present endogenous optical biomarkers sensitive to impaired wound healing. Optical imaging methods are widely used to visualize tissue sections and monitor in vitro cultures. However, adapting microscopy techniques to non-invasive intravital assessments can be a difficult, but rewarding, challenge as we demonstrate in our recent paper in Communications Biology. Our lab focuses on label-free multiphoton microscopy (MPM) to evaluate skin wound metabolism. Preliminary work using unstained skin tissue sections demonstrated a sensitivity to the wound healing process1, but expanding this work to in vivo longitudinal assessments of healing is a critical first step to translating this technology to the clinical management of chronic wounds. Chronic wounds are the result of severe complications during healing that can result from mechanical pressure, advanced aging, vascular disease, neuropathy, hyperglycemia, and/or infection. One of the most common forms of chronic wounds are diabetic ulcers that appear as deep, full thickness cavities in the skin of the lower legs and feet. Diabetic ulcers are dangerous to patients as they are associated with an high rate of mortality and are the second highest leading cause of lower extremity amputation2. Unfortunately, there is a lack of quantitative biomarkers to noninvasively monitor and predict skin wound healing. To address this problem, we have been exploring how MPM can be used to noninvasively quantify wound status over time. MPM is ideal for collecting metabolic information based on the autofluorescence of the cofactors NADH and FAD relatively deep into the skin through the use of near infrared excitation wavelengths. However, early into this project, we found that quantitative measurements of NADH and FAD were challenging to obtain from wounds in vivo due to the presence of additional fluorophores present in keratin, hair, and the extracellular matrix. Furthermore, imaging the weak natural fluorescence of NADH and FAD with high contrast and high resolution was challenging in our mouse model due to motion artifacts associated with breathing. Figure 1. A 3D z-stack of endogenous optical signals at the wound edge delineating various regions of tissue. Z-stacks enabled morphological assessments of skin tissue and allowed optical signals from the epidermis to be spatially isolated. Scale bars are in µm. To solve these technical challenges, we first prioritized rapid image acquisition. We used resonant galvanometric mirror scanning with piezoelectric-driven objective scanning to acquire a 250 µm thick stack of images at the wound edge in ~3.5 seconds. While we were able to minimize the number of images affected by motion artifact, the pixel dwell time of the individual images was so low that it was difficult to resolve wound features. We overcame this issue by acquiring multiple image z-stacks, performing correlation-based image registration of the z-stacks, and then averaging all z-stacks together to produce a high contrast image without motion artifacts. The result was a 3D z-stack of the wound edge (Figure 1) created solely from endogenous optical signals without mechanical restraint of the tissue. 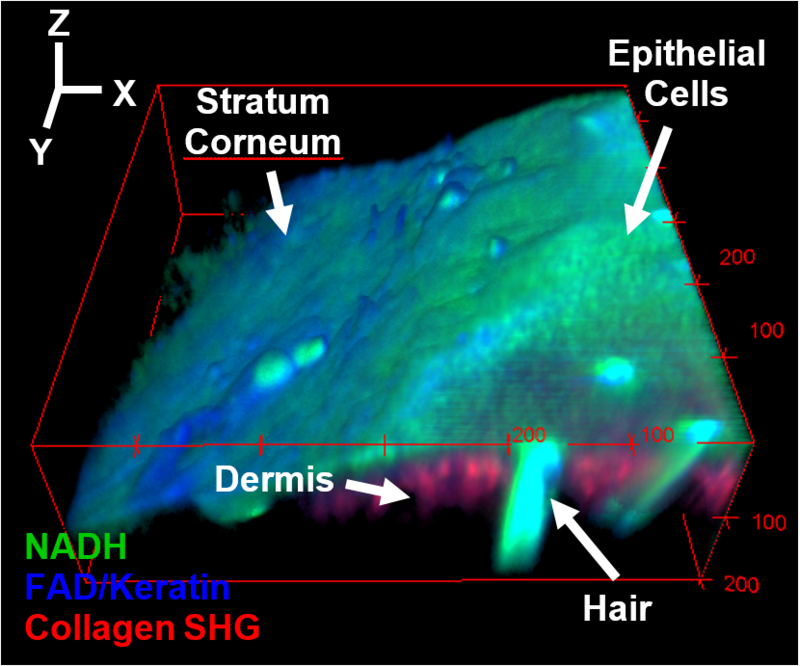 Using these 3D image stacks, we were able to delineate different regions of the wound site such as the epithelium, dermis, hair follicles, and stratum corneum. Figure 2. Images of keratinocytes at the wound edge from the midpoint of an in vivo z-stack after image processing. Our in vivo MPM methods were able to generate high-resolution images of NADH and FAD autofluorescence which allowed us to make longitudinal assessments of the optical redox ratio and NADH lifetime as individual wounds healed over time. Once the different regions of the skin wounds could be isolated, we were able to quantify a normalized optical redox ratio of FAD and NADH in the epidermis at the wound edge (Figure 2). The redox ratio was sensitive to the proliferation of keratinocytes at the wound edge and was able to differentiate diabetic wounds from control wounds in vivo. NADH fluorescence lifetime images (Figure 2), which are sensitive to protein-binding status, also revealed longitudinal metabolic changes in healing and helped contextualize our optical redox ratio findings. Collectively, these noninvasive optical measurements can provide valuable insight into the progression of skin wound healing. With the advent of clinical multiphoton systems such as the MPTFlex™3 and emerging techniques for rapid metabolic imaging4, these biomarkers may serve useful roles in guiding therapy and evaluating treatment efficacy in the clinical care of chronic wounds. 1 Quinn, K. P. et al. Diabetic Wounds Exhibit Distinct Microstructural and Metabolic Heterogeneity through Label-Free Multiphoton Microscopy. J Invest Dermatol 136, 342-344, doi:10.1038/JID.2015.371 (2016). 2 Calle-Pascual, A. L. et al. Nontraumatic lower extremity amputations in diabetic and non-diabetic subjects in Madrid, Spain. Diabetes Metab 23, 519-523 (1997). 3 Balu, M. et al. In vivo multiphoton NADH fluorescence reveals depth-dependent keratinocyte metabolism in human skin. Biophys J 104, 258-267, doi:10.1016/j.bpj.2012.11.3809 (2013). 4 Stringari, C. et al. Multicolor two-photon imaging of endogenous fluorophores in living tissues by wavelength mixing. Sci Rep 7, 3792, doi:10.1038/s41598-017-03359-8 (2017).